More than 13,000 Central Maine Power customers were without electricity Saturday night. A nor’easter moved through Maine on Saturday, bringing rain, high winds and power outages, as well as snow to interior and western areas and the potential for minor flooding along the southern coast. The storm hit York and Cumberland counties during the late morning hours. It rained heavily at times throughout the afternoon, but by Saturday night most of the heavy rain and mixed precipitation had begun tapering off, leaving only light rainfall and gusty winds expected overnight, according to Bob Marine, a meteorologist with the National Weather Service in Gray. Marine said the overnight would likely bring sustained winds of between 15 and 25 mph for most of the state, with gusts of up to 50 mph, especially along the coast. A wind advisory was posted for the coast and a winter weather advisory will remain in effect for the mountains and foothills until Sunday morning, he said. More than 13,000 Central Maine Power customers were without electricity around 8 p.m. Saturday. The areas most affected were York, Oxford, Cumberland, Knox and Waldo counties. And only 310 Emera Maine customers were without power, primarily in Blue Hill and Surry. 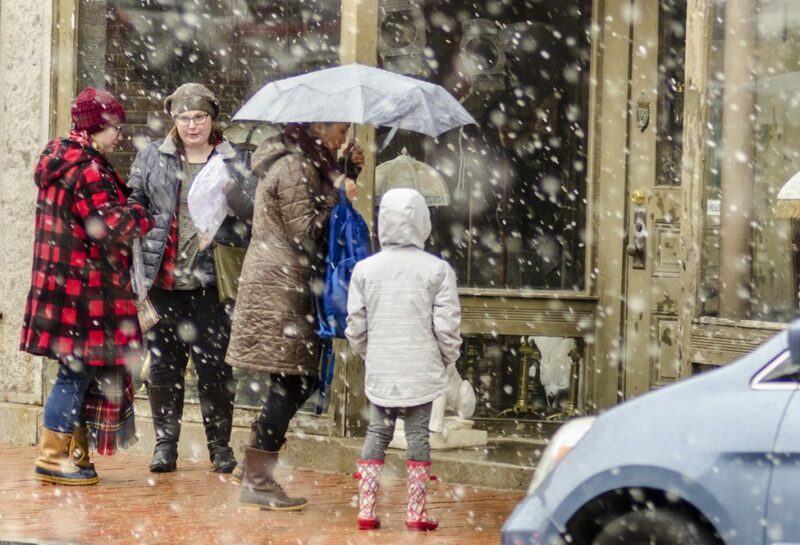 While coastal areas mostly experienced rain with some snow and sleet mixed in, snow fell farther inland and in the higher elevations, ranging from a dusting in the Sebago Lake region to nearly an inch in the hills and mountains, Marine said. The storm should be wrapped up by midmorning Sunday in southern Maine as drier air moves in, but scattered rain and snow showers were forecast for much of Sunday in the mountains. The storm made for some tricky driving conditions north and west of Portland during the afternoon. The Maine Turnpike Authority lowered the speed limit to 45 mph on the turnpike at 1:30 p.m. from the New Gloucester tolls at mile 67 to the end at mile 109 because of snow. The turnpike reported at least two crashes on the highway, one at mile 75 southbound in Auburn at 1:15 p.m. and another at mile 100 southbound in Sabattus at 1:27 p.m. But normal speeds were restored shortly after 4:40 p.m.
Across Kennebec, Franklin and Somerset counties, reports of traffic accidents, overturned vehicles and cars off the road on both major and secondary roads kept law enforcement officers and first responders busy. In Winthrop, police dispatcher Dana Massey said Main Street was “a little greasy,” and road crews would be out. An accident on Route 202 near Blue Rock Road in Monmouth drew a police response, Massey said, but the road remained open for traffic. The storm was forecast to drop 1.25 inches of rain along the southern coast and an inch in interior locations, said Nikki Becker, a meteorologist with the weather service. Minor flooding was expected along the coast, with high tides about 1:30 p.m. Saturday and 2 a.m. Sunday, and seas possibly reaching 6 to 10 feet. In Portland, only minor flooding at high tide in the areas of Whole Foods on Marginal Way and Portland Pier was reported, according to Jessica Grondin, communications director for City Hall. “Rainfall intensity was not extreme enough to trigger major issues,” Grondin said. Once this storm passes, there won’t be much time to dry out. Another storm system should move in Monday, with more rain possible Tuesday night and Wednesday night into Thursday. Staff Writer Jessica Lowell of the Kennebec Journal contributed to this report.